Wilmington Drama League's cast of Cabaret. Photo courtesy of Wilmington Drama League. Willkommen, bienvenue and welcome to The Wilmington Drama League’s production of the 1967 Tony Award-winning Cabaret. It’s Berlin, soon before World War II, and people should forget their woes at the exciting Kit Kat Klub. But trouble abounds as creativity, possibility and budding romance is swallowed by fear, hate and misfortune. The diverse cast – directed by Dominic Santos with music direction by Caty Butler – takes a modern view of the themes in this classic musical. If you're unfamiliar with the content and plot, the mature subject matter may not be suitable for younger audiences. Sexuality, abortion, drug use and racism are woven throughout the multiple storylines which result in adult language and situations. But please don’t let this warning stop you from coming to the theater and enjoying an excellent production…just get a babysitter! Cara Clase as Sally Bowles. Cabaret kicks off with the Kit Kat Klub’s Emcee welcoming us with the charming Willkomen. Brian Hylton introduces us not only to the club, but to his character and its troupe of risqué entertainers. The company (both male and female dancers) is energetic, attractive and synchronized. 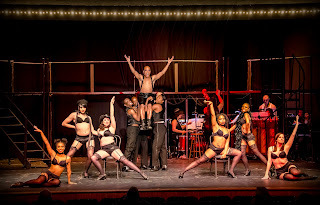 The opening number is wonderfully choreographed by Santos, showcasing all of the best attributes – vocal, physical, sensual, and comedic – Pam Atk, Cheynne Banks, Timmy Bradford, William Brock, Heather Wadler, Taylor Walker, Eryka Waller, Austin Whittington, Sedric Willis and Morgan Wright who also appear throughout the show in other roles. Aspiring young American author, Cliff Bradshaw (Jason Tokarski), arrives to Berlin by train and befriends German passenger Ernst Ludwig (Timothy Sheridan). Ludwig helps him find a room with Fräulein Schneider (Kyleen Shaw), who laments that she has learned to take whatever life offers in her musing, So What?. Ernst has also sold Cliff on the allures of the Kit Kat Klub. Entranced and flirting with British singer Sally Bowles (Cara Clase) – who performs the racy, flirtatious number Don’t Tell Mama with the Kit Kat Girls – Cliff offers to walk her home. Sally warns him that her boyfriend Max (Sedric Willis), the club’s owner, is jealous so Cliff is surprised when Sally arrives at his room the next day looking for a place to stay. At first he resists, but she convinces him (and Fräulein Schneider) to take her in during the song, Perfectly Marvelous. Kyleen Shaw as Fräulein Schneider & Alfred Lance as Herr Schultz. 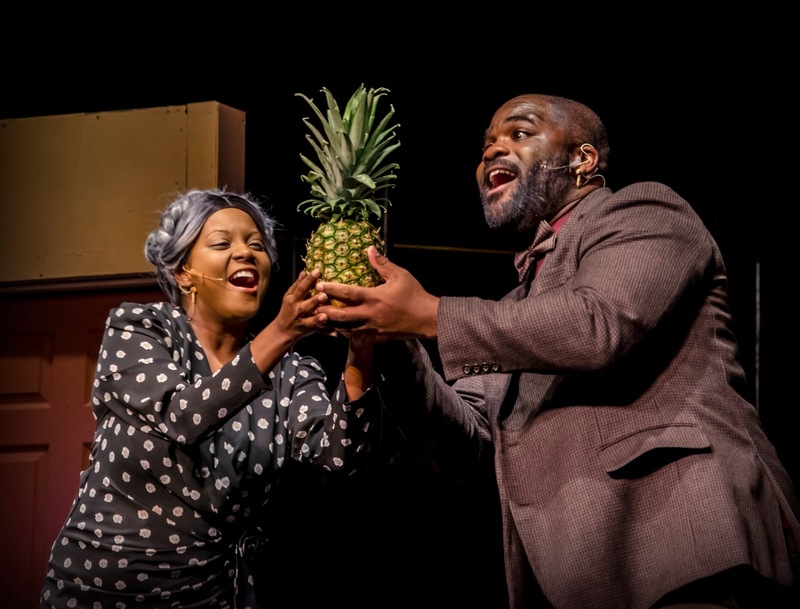 Meanwhile, an elderly Jewish fruit shop owner Herr Schultz (Alfred Lance) has given Fräulein Schneider a pineapple as a gift, singing It Couldn’t Please Me More. It’s a touching moment at the boarding house that segues into a darker one in the Kit Kat Klub, as a young waiter starts to sing a patriotic anthem to the Fatherland that slowly descends into a Nazi-inspired marching song before arriving at the strident Tomorrow Belongs to Me. Months later, Cliff and Sally are together and in love. Sally sings of hope that this time her love affair is going to last (Maybe This Time). Sally reveals to Cliff that she is pregnant, but reluctantly decides to get an abortion. Cliff tries to convince her to keep the baby...but he'll need money, since efforts to write his novel have stalled. Ernst offers Cliff a job picking up a suitcase in Paris and delivering it to his “client” in Berlin. The Emcee comments on this dubious arrangement between Ersnt and Cliff in the song Money. This is neither the first nor the last time the ubiquitous Emcee involves himself in the plotlines of other characters and stories in this show. Hylton provides a strong character who moves the plot along with commentary and humor, but reminds us of the seedy elements. His efforts are wildly physical and emotional with impeccable timing, grace and strength. Hopefully, his first WDL role will not be his last! Meanwhile, Fräulein Schneider has caught one of her boarders, Fräulein Kost (Pam Atk), bringing sailors into her room. Schneider forbids her from doing it again, but Kost threatens to leave and mentions that she has seen Schneider with Schultz in her room. Schultz comes to her reputation's rescue, announcing he and Schneider are to be married – and notes that his proposal was serious in his song, Married. At Schultz and Schneider’s engagement party, Cliff arrives and delivers the suitcase to Ernst. A tipsy Schultz lets slip to Kost that he is Jewish, who then relays the word to Ernst, who ominously warns Fräulein Schneider that marrying a Jew may not be wise. The Entr’acte showcases Music Director Butler’s abilities and arrangement skills. The 10-piece ensemble sits on stage and provides the perfect audial and visual components for this production. From the swinging club to the heartfelt songs, the musicians know how to accompany the singer or lead the procession. Back at the Kit Kat Klub, our Emcee performs a song-and-dance routine with a gorilla in a dress, singing that their love has been met with universal disapproval (If You Could See Her). Encouraging the audience to be more open-minded, the scene is a powerful statement to prejudice and foreshadows the darkness in the remainder of the show. Fearing the unknown in Germany, Cliff pushes Sally to return with him to America – an idea to which she protests. After they argue, Cliff is offered another "job" by Ernst, ending in Cliff being beaten up by Nazi goons. While onstage, Sally enters to sing “Life is a cabaret...” and cements her decision to live in carefree ignorance and freedom. This is where the effervescent Clase truly shines. To this point in the show, all of her vocal performances were incredibly strong, but her passionate rendition of Cabaret drew the audience into her character’s emotional state. We hung on every note and the haunting pauses between them, empathizing with Sally’s plight. Case was a joy to watch as she took Sally from a blithe nightclub singer to a hardened woman who won’t let the world keep her down. Like Hylton, let’s hope that Clase follows up her WDL debut with an encore. The next morning, as Cliff is packing to escape Berlin, is visited by Sally, who bears her soul but refuses to leave with him. Cliff departs for Paris, heartbroken and alone (Finale). Don’t expect a (cathartic) curtain call for this outstanding group of performers. Santos has opted to allow the depressed emotional mood to linger. We only see the cast walk offstage in a dispassionate manner. But the cast, crew and musicians are worthy of hearty applause for their excellent work. 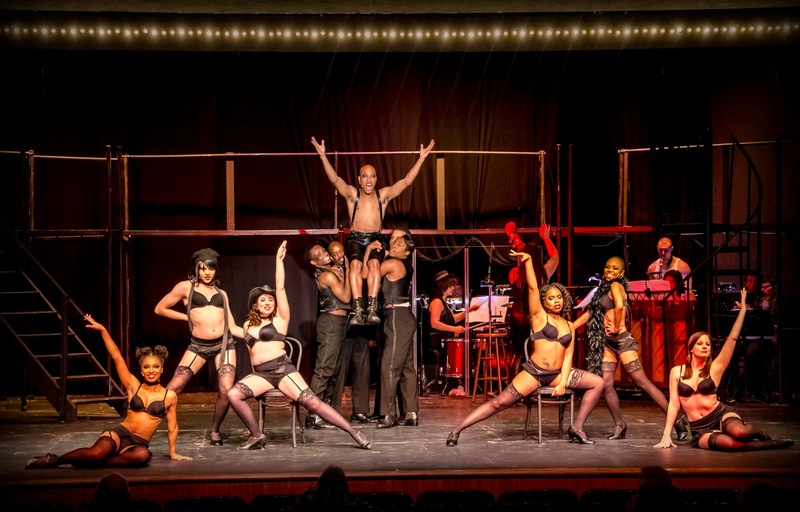 This production of Cabaret at Wilmington Drama League runs Fridays, Saturdays and Sundays through February 5 at its venue on Lea Boulevard in Wilmington. Tickets are $12-20 for both evening (8:00pm) and matinee (2:00pm) performances.